America’s Forgotten Heroine: Ida Lewis, Keeper of the Light is an historical documentary that focuses on the intriguing life story of this country’s most famous maritime heroine. Rhode Island PBS premieres the documentary on Monday, September 8 at 8 p.m. Written, directed and produced by Marian Gagnon of Goodnight Irene Productions, this 45-minute documentary film provides an intimate portrayal of Ida’s life from age 15 to 69 (from 1857 to 1911) and the passion and moral fiber she intrinsically brought to her work as a lighthouse keeper and unlikely heroine. It also explores the myriad decisions which led to a life of both fame and isolation, Ida’s unexpected celebrity in Newport as well as across the U.S., and the impact she inadvertently had on the early women’s rights movement. As John Williams Haley, author of The Rhode Island Historian wrote in 1939: "...of all the Rhode Island women who have achieved fame in one way or another...and there have been many...none attained the world renown of a modest little woman who was born and lived most of her life in Newport. In fact, it would hardly be exaggeration to say that she was more famous, particularly during the latter half of her life, than any American woman of the past or present." While this statement may very well stand today, Ida’s story has largely been forgotten. 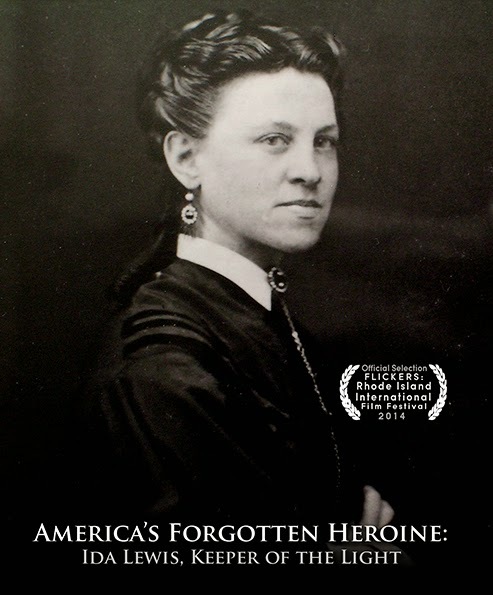 Gagnon’s goal with this film is to renew the “national memory” of Ida Lewis as an American heroine not only in her hometown of Newport and throughout R.I., but across the United States. Indie-filmmaker Marian Gagnon researched, wrote, directed, and produced this film with the help of grants from the R.I. Council for the Humanities (RICH), the Rhode Island State Council for the Arts (RISCA), and a donation from the Ida Lewis Yacht Club. Gagnon is a professor in the College of Arts and Sciences at Johnson and Wales University. The videographer and editor is Jim Karpeichik of Ocean State Video. Both are Emmy nominees. Chris Robadue of Wave Garden Arts is the animator. The film premiered to a standing-room-only crowd at the Casino Theatre in Newport in late May and recently screened at venues throughout South County. It also was selected for the 2014 R.I. International Film Festival.